A new nautical-themed pub has opened in Skegness after a £250,000 transformation of the premises. Formerly Yates, the changes at the new Embassy Centre Jolly Fishereman pub are said to go beyond the interior, as the outdoor area has also received an upgrade with a brand-new look and feel. The Jolly Fisherman opened on Monday with new menus across food and drink, combined with a host of offers throughout the week. 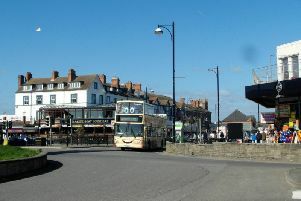 Management says the pub is set to become the place-to-be in Skegness for drinks with friends or a bite to eat. Veggie and vegan specials complement the staple favourites of burgers, Sunday roasts and much more. From a drink’s perspective, a wide selection of hand-pulled cask ales complements the extensive beer, wine and soft drinks serves, catering for any occasion or group. On Friday and Saturday nights the pub will really come to life and become a true destination for those looking to party. The new name brings an amazing new look for our interior and exterior, a great selection of well-priced food and an enviable range of drinks to sample.